Also known as Common verbena, Herb of grace, Herb of the cross, Holy herb, Holy wort, Herba sacra, Herb of enchantment, Wild hyssop. A hardy perennial growing up to a metre high with small pale lilac flowers on slender spikes. Said to be a cure-all with a wide range of applications. it may help with coughs, colds, indigestion, insomnia, depression, hot flushes. May help in bringing down temperature and has anti-inflammatory and mild pain killing qualities helping with headaches and pre menstrual syndrome. 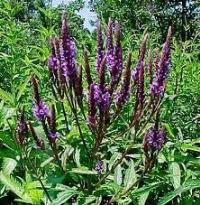 Many of the names for this herb originate from the story of its discovery on the Mount of Calvary where it is said to have stunched the wounds of the crucified Christ. 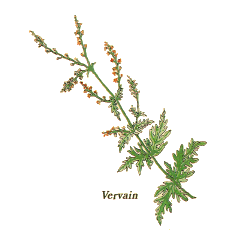 Vervain used to be placed around fields to prevent bad weather. It was sacred to the Norse god Thor, god of thunder. It was used by ancient smiths to harden steel. In Holland, Germany, Denmark, Slovakia and Finland it is known as the'Iron Herb'.